Producing content for the web, such as pages, templates for interactive websites and front-end systems, is a highly involved process that calls for experience working with several pieces of commonly used software. 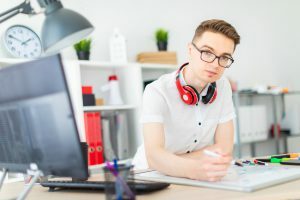 Whether you’re planning to build a large website or preparing to start a career making sites for others, it’s helpful to familiarize yourself with the use of Photoshop, Illustrator, Dreamweaver, Flash and ActionScript. Every package is sold by Adobe, and they’ve all become a big part of the backbone of the modern Internet. Each one is a powerful tool that takes some time to learn to the point that you can produce professional-quality work, but the payoff for getting to know them is tremendous. Programs developed by Adobe are available both in off-the-shelf packages and as downloads. You can purchase them collectively as part of the company’s Creative Cloud offerings or separately. Adobe’s requirements indicate that it may run on as little as 2 GB of RAM, but it’s probably wise to use a computer with at least 8 GB of memory. The lowest recommendations indicated are for a Pentium 4 or an Athlon 64 processor, but you’ll likely want to invest in a computer with at least an Intel Core 2 Duo or an AMD Phenom II. There’s no such thing as having too much computer for running Adobe Creative Cloud. To take advantage of built-in 3-D capabilities, you’ll need a modern graphics card. It should support at least OpenGL 2.0 and Shader Model 3.0. Users should have at least 2.6 GB of hard drive space available. Plan for using more than 10 GB if you intend to install more packages. You should also plan for extra storage space. Adobe Creative Cloud should operate on Mac OS X 10.6.8 or later, and Windows users can utilize Microsoft Windows 7 or higher. If you plan to work heavily with making raster or vector graphics files, it may be wise to invest in a pen-tablet interface. This will make the drawing process feel more natural. Photoshop allows you to tweak virtually every aspect of a picture, from size to color levels. If you can’t find a built-in feature that serves the purpose you need, there’s a plug-in designed for the job out there somewhere. Photoshop is Adobe’s flagship product. The package allows you to work interactively with other products in the company’s collection, so you can easily import and export files as part of a larger workflow. While editing photos and raster graphics is nice, you may want to produce line drawings. The vector graphics file type family provides a feature that you won’t see in Photoshop: scalability. You can resize anything you draw in Illustrator, making it ideal for creating things like logos and typography. This makes it easy to resize an image you created or re-arrange the elements within it. Bringing all the elements you’ve created together on an HTML-based web page is likely to be your ultimate goal. Dreamweaver is a product, originally designed to be a layout tool. It has since grown into a robust platform for both page layout and coding. Dreamweaver offers support for a slew of popular programming languages used to produce dynamic pages, including PHP and .NET. You’ll also be able to produce CSS files in Dreamweaver. Providing interactive content on a web page can be a challenge, a common solution is to use Adobe Flash. You can use Flash to produce everything from online games to web-based video players. Flash still remains a go-to tool for many developers, especially ones who want to limit access to underlying code. Using SWF files, you can embed your desired content on any HTML page, giving users an extra level of value. Learning to use the programs contained in the Adobe Creative Cloud suite can expand your web designer skills. The skills learned can also be extend to other endeavors, such as graphic design, print and server-side programming. At the Institute of Production and Recording, students learn how to be creative with audio and visual design. If you are interested in Adobe products you may also be interested in learning about Digital Video and Media Production. IPR’s digital video and media production degree programs prepare you for a real-world role in video editing, production management, camera and lighting effects, and visual story development through a learning experience in professional studio classrooms. Our digital video and media production associate and bachelor’s degree paths can lead to a variety of entry points in the video and film production industry. Located in the heart of Minneapolis’ arts and entertainment district, the Institute of Production and Recording provides hands-on training in media, video, sound, music and live show production. Learn from award-winning faculty who are working in the fields they teach and tap into their network of industry connections. Fine tune your music production, recording, and engineering skills with 24/7 access to the latest software and equipment in our professional studio settings. Contact us today to learn more about starting a rewarding career in the music industry.